Cleansing Body Oil 60 ml ℮ 2 fl.oz. Nourishing Body Cream 60 ml ℮ 2 fl.oz. An enchanting set of three almond-enriched body treats for hydrated and delicately scented skin. Plus, a micro-fiber shower mitt to help evenly distribute the Cleansing Body Oil and make cleansing soft and pampering. This limited-edition set makes the perfect holiday gift. This luxurious, almond oil enriched body cleanser transforms from an oil to a light cream, leaving skin feeling satiny-soft, clean and cared for. Nourish, soften and delicately scent the skin with this lightweight, moisturizing body cream. This moisturizing and lightly scented oil spray dries down to a velvety smooth finish, for an alluring glow on the skin. 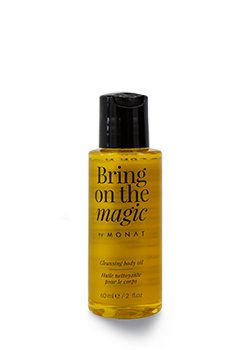 Cleansing Body Oil- In shower, apply to damp skin, lather and rinse. Nourishing Body Cream- Massage into body after bathing or anytime skin feels dry. Dry Oil Body Spray- Spray in hands or directly on the body. Massage into the skin.